The Pens played New York Rangers hockey for Games 1 and 2, earning a 1-1 series split heading into the two game stand at Madison Square Garden. 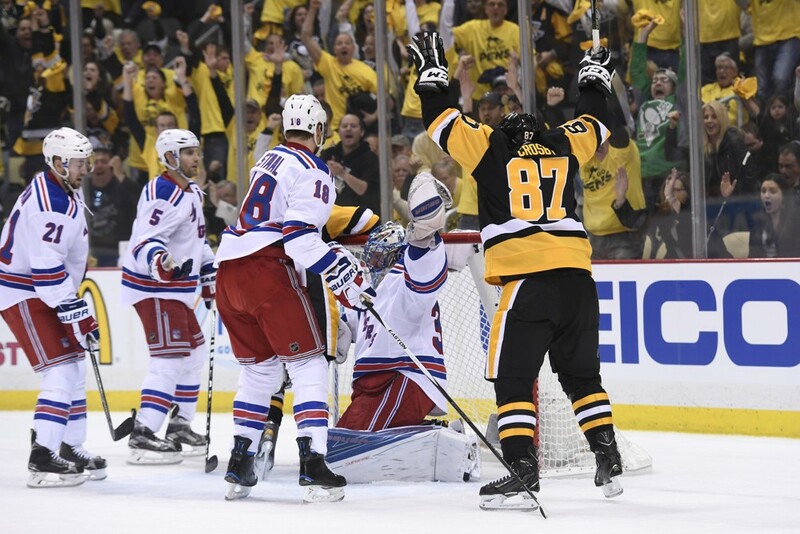 They got back to playing Pittsburgh Penguins hockey starting in Game 3, leaving the Rangers like many of their other opponents over the past month of the regular season - utterly and thoroughly dominated. The Penguins can clinch their first round series and get past their postseason nemesis with a win today to punch their ticket to the Eastern Conference Semifinals. They'll most likely face the Washington Capitals if they get there, though the Caps are halfway through blowing a 3-0 series lead to the Philadelphia Flyers in impressive fashion. The Penguins also got to Henrik Lundqvist in impressive fashion in Game 4 after struggling to solve the New York netminder through the first three games. Eric Fehr opened the scoring 1:09 into the game, and Pittsburgh scored 4 goals on their first 18 shots to chase him from the net. New York has little chance to extend the series if Lundqvist can't be the brick wall they need on the back end, and they'll also have a tough time of it if Matt Murray continues to play at the level he has. Matt Murray has stopped 47 of 48 shots he's faced against the Rangers with the lone goal allowed coming on a shorthanded odd-man rush. His presence in goal has allowed the Pens to return to the aggressive team that dominated the closing stretch of the season, and he's been more than capable of turning away good scoring chances coming his way. The Pens are difficult enough to beat at even strength, but if they can continue to maintain their production on special teams they could be unstoppable. The New York Rangers are 1-for-16 (6.3%) on the power play in the series, which isn't particularly surprising given that Pittsburgh was 5th in the league with a 84.4 PK% during the regular season, but an up and down Pens power play is clicking on all cylinders. They've gone 7-for-19 (36.8%) with the man advantage through the first four games, and having Evgeni Malkin back in the lineup certainly helps. Malkin is still shaking off the rust after playing in only 9 of 34 games after the All Star Game, but that hasn't stopped him from holding a share of the team's scoring lead with Sidney Crosby with 6 points despite missing Game 1. At the end of the series, the story is shaping up to be that the Pens stars are outshining the Rangers stars, that the Penguins depth players are outplaying the Rangers depth players, and the Pittsburgh special teams are thoroughly outplaying New York's. Pittsburgh came into the series as the heavy favorites, and save for controlling possession in the first two games as the Pens compensated for having Jeff Zatkoff in net the Rangers haven't been able to do any of the things they needed to stage an upset. Unless something changes in a hurry, they'll have a long offseason to think about what they can do better the next time. - In Game 3, Matt Murray was the youngest Pens goaltender to start a playoff game, and in Game 4 he became the first Pittsburgh rookie to pitch a postseason shutout. - Sidney Crosby (46 goals) and Evgeni Malkin (44 goals) continue to move up the postseason goal scoring list for the Pittsburgh Penguins with Crosby now tied for 3rd in team history with Kevin Stevens while Malkin is in striking distance of catching the former winger. Both will have a long way to go in order to catch Jaromir Jagr (65 goals) and Mario Lemieux (76 goals) for most in franchise history.